The US Democrats vowed to fight "extreme" Republican policies as George W Bush saw in his second term as president with a lavish inauguration. Despite their poor showing in last November's elections, they said they would refuse to be sidelined. They have demanded a full debate in Congress before approving Condoleezza Rice as the new secretary of state. 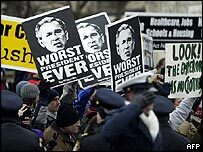 But some Democrats said they were heartened by the conciliatory tone of Mr Bush's inaugural speech. The president and first lady rounded off four days of inauguration celebrations by attending prayers at Washington National Cathedral on Friday. Christian, Jewish and Muslim clergy were at the service, along with more than 3,000 guests including cabinet members and White House aides. Outgoing Democratic Party chairman Terry McAuliffe sent a defiant message to members as Republicans celebrated Mr Bush's inauguration. "Today... Republicans are hoping that we'll fade into the background," he wrote. "They're hoping that for the next two years we'll sit on the sidelines, and let them ram their agenda through. "But we Democrats will never step aside. While Bush tries to build his legacy on a series of attacks against working families, the middle class and seniors, Democrats will be there to stand up." Senator Charles Schumer, chairman of the Democratic Senatorial Campaign Committee, sent an equally strong message in a fund-raising email to supporters. "When the inauguration bands stop playing and Congress comes back into session, we Democrats will be on guard and ready to fight against the Republicans' extreme policies once again." John Kerry, the Massachusetts senator who fought Mr Bush for the presidency last November, was more conciliatory. "There has been a lot of talk over the last four years about uniting Americans. I hope now there will be a real effort to make true bipartisanship a priority. I'll be ready to reach across the aisle anytime we can work in good faith to make our country stronger," he said. His sentiment was echoed by the Senate Democratic leader Harry Reid. "This country needs unification, we have been divided too long," he said. In his inaugural speech, Mr Bush talked of divisions - both at home and abroad - and promised to "strive in good faith to heal them". But correspondents say that resolve may be tested domestically in the coming days after the Democrats delayed the confirmation of Condoleezza Rice as secretary of state until next week. They said they wanted more time so they could debate Iraq and other foreign policy issues. 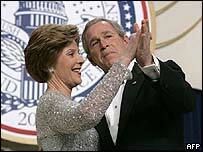 In his inaugural address, heavy on foreign policy rhetoric, Mr Bush pledged to use the force of freedom to support democracy, "with the ultimate goal of ending tyranny in the our world". While praising Mr Bush's goals as "laudable", Human Rights Watch said his administration flouted international standards by the treatment of prisoners in Iraq, Afghanistan and Guantanamo Bay in Cuba. "It is one thing to say you are on the side of freedom, it's quite another to be a leader in promoting the rights that protect that freedom," said Kenneth Roth, the group's executive director. What is State of Union speech?